A Grand Exhibition opens an Activist Art Space at the old Convergence Center, February 9th. GRAND OPENING of... ARTS IN ACTION! 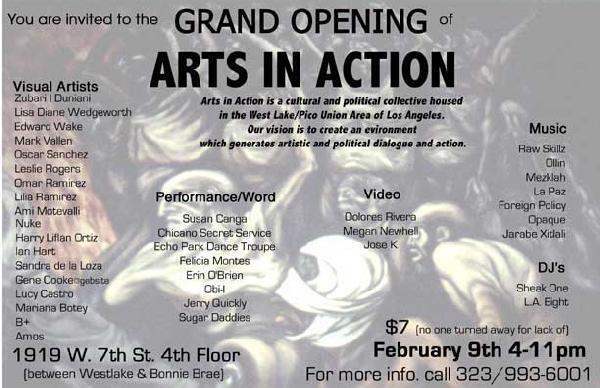 Arts in Action is a cultural and political collective housed in the West Lake/Pico Union Area of Los Angeles. Our vision is to create an environment which generates artistic and political dialogue and action. Dolores Rivera, Megan Newhall, Jose K.
Raw Skillz, Ollin, Mezklah, La Paz, Foreign Policy, Opaque, Jarabe Xitlani.